Building on the experience gained with the EMMY award winning ultima APX and ultima APX-RS cameras, the FASTCAM SA1 is our most light sensitive camera yet, as well as providing the greatest color fidelity of any high speed camera available, thanks to true 12-bit performance. The FASTCAM SA1 provides the perfect tool for those looking for mega pixel resolution at high speeds, as well as those demanding sensitivity and performance with an SDI digital output for TV/movie and commercial work. – Eight (8) Gigabytes for around six seconds record duration at full resolution 1,000 fps. – Sixteen (16) Gigabytes for around eleven seconds record duration at full resolution 1,000 fps. – Thirty two (32) Gigabytes for around twenty two seconds record duration at full resolution 1,000 fps. – Sixty four (64) Gigabytes for over forty three seconds record duration at full resolution 1,000 fps. The FASTCAM SA1 is supplied with our new RS422 LCD equipped keypad, making computer-free setup and operation a good deal easier. Rear panel BNC connectors provide users with two HD-SDI and one composite (NTSC or PAL) outputs. 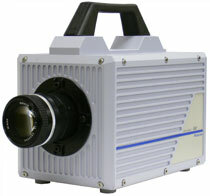 The option of a one micro second shutter (previously 2µs) and reduced time between two frames make the FASTCAM SA1 ideal for Particle Image Velocimetry (PIV, Digital Image Correlation(DIS) and ballistics research.